Glenbard has an online store through SchoolPay. Eligibility for items can be controlled through group enrollment in PowerSchool. 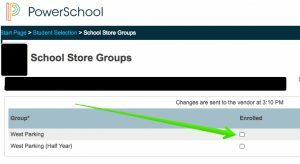 The PowerSchool group enrollments are sent to SchoolPay each afternoon. Search for and select the student in PowerSchool. Scroll to the Administration heading on the Navigation menu on the left. This completes the enrollment process.